I want you to think for a second about the way you talk to your daughter (or the way your husband talks to your daughter) when she is practicing or playing a game. Is it positive? Is it empowering? Is it in a good tone? Now think for a second more. Are you being honest with yourself and is how you think you are talking to your daughter the actual way? How you are talking to your daughter affects her far more than you know. 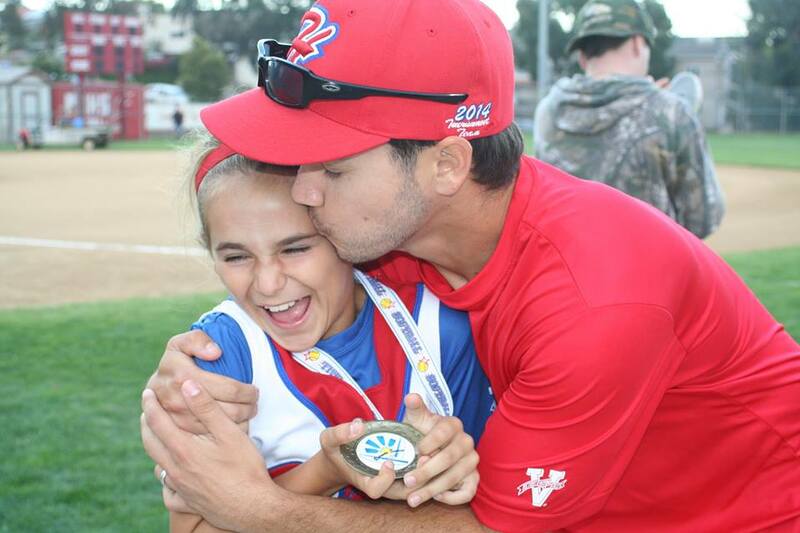 Right now, envision the relationship you want to have with your daughter once softball is over. This subject to me is overly important for many major reasons: I see how some Dads talk to their daughters at lessons/tournaments/clinics, I know the effect my dad had on me personally (for the better), and I have seen the negative consequences from how some dads of friends or acquaintances have effected their lives now that they are in their 20’s and 30’s. To the Dads who sit on a bucket or show up to hitting lessons and have a smile on their face, don’t say a word or give constructive criticism at the right times, THANK YOU. Pat yourselves on the back. YOU are making our sport better and working to make your daughter into a confident young woman. To the Dads who have a yelling issue or cannot speak to their daughter’s in a supportive way…we need to talk…. When I write this, replace “yelling” with any negative/unsupportive communication word of your choice; it does not JUST have to be yelling (could be bad body language, throwing things, overall tone/words). Remember, you can be “YELLING” by not raising your voice – your body says it all. Ok, so you had a tough day at work (we all have them). Be a grown up and be able to compartmentalize work and softball. Come home in the afternoon and have a fresh start with your daughter and be able to put work away for a little bit. You are able to control how you talk to your daughter and how you treat her during practice. Not only are you creating a better environment for her practice with you, you are also teaching her that when she has days with school AND practice, she, too, needs to be able to put school/relationships/problems aside, and be present, focused and a good teammate at practice. Set a good example of what it looks like to allow yourself to put problems once you show up to the softball field. Yelling is just plain awkward…for others around you. If you’re yelling at someone, it makes everyone else around you uncomfortable. You may feel better because you are getting out emotions and think you’re proving a point, but believe me, everyone around you does NOT feels at ease. It makes others around you tight. Tightness does not lead to good physical results. Be someone who lifts others up, not bring them down. Create an environment that makes others around you better; and an environment that does not consist of demeaning or reprimanding a player for lack of success or results. That yelling has the opposite results of what you want – for more than just 1 person. Learn a better way to communicate. I might be wrong here, but I feel like people yell because they feel like they cannot be heard. There are better ways to communicate than to yell. When you are loud, you are itching for someone to hear you, when really, it’s usually when your daughter starts to tune you out. If you are trying to communicate something to someone and they are not hearing you, then it is your job to try to get through to them by finding a different way to word what you are saying. Remember, we ALL communicate differently. Yelling usually doesn’t make someone hear what you are trying to tell them. When you are yelling, you are missing our on opportunities with your daughter to help her grow. Those moments of yelling are a waste of time and could be replaced with more positive words to help your daughter get more belief in herself. When you communicate, challenge yourself to come up with a more creative way of speaking to your daughter if you don’t feel she is listening to what you are saying. Communication is key in life, especially once softball is done. By teaching your daughter to communicate effectively, you are setting a good example around her for something that will benefit her future past softball. Want someone yelling at you at your job? How would you like it if someone was sitting over your shoulder at work and constantly yelling at you your every move if you weren’t doing things perfectly? “NO that’s not how you do it, do is THIS way.” Would that make you feel more comfortable at work? I think not. Softball is fun, but you also work at it like it’s a “job.” YOU might be learning something new and challenging at work, just like girls are learning softball. Softball is not easy. YOU get to hide at work and maybe make mistakes where the whole entire company doesn’t know you messed up. In sports, you’re on a stage, where people already know if you mess up, you don’t need someone reminding you that you made a mistake by vocalizing it during practice or at a game. Trust me, as a player, 90% of the time you KNOW when you’ve made a mistake. The other 10% of the time should be used for teaching a part of the game that the player might not know, yet. You are setting the standard for future relationships. I want you to think on a very serious note for a second. If your daughter is growing up with you yelling at her, your tone and and yelling is all she will know about communication. Are you teaching her that it’s ok for other males to yell at her? I know you’re not meaning to, but think about it for a second. Right now, at this moment, you are most likely the most important male figure in your daughter’s life. It’s important you act like it. How you treat her and speak to her is influencing what is acceptable for how future males will speak to her. So if you are yelling at her and talking down to her, you are indirectly telling her that it is ok for a man to yell at her. Dads, let me ask you a question: is it ok for a man to yell at your daughter? Set the standard for how a man should treat your daughter. It’s serious, but dads, you can set the standard on an every dad basis for your daughter and/or the team you coach. Set the very best example that you can and think bigger picture than what the score is at the end of the game TODAY or how your daughter is pitching or hitting that DAY. This last reminder is THE reason why I am addressing the Dads and not lumping the moms in there as well. (Moms, we can talk later). work on these things, just like your daughter is working on softball. You have time to get better! For my big yellers out there (you know who you are), I think understanding why you are yelling in the first place is a critical part of working on it. There really could be various reasons you choose to yell rather than articulate your words in a more supportive tone….Maybe you’re frustrated with the money they are spending on softball and not seeing results in the timely fashion that you think you should be seeing results. Maybe you are unhappy about some other part of your life. Maybe you are frustrated about your athletic career. Maybe you are yelling because that’s how your dad treated you. Maybe you are frustrated with your daughter’s playing time. None of them are really valid excuses to lose your cool and yell during softball. If you are trying to teach your daughter to grow in the sport of softball and in life, it is your job to set an example and grow with her. You are never too old to stop growing. Take a step back and commit TODAY to being better for your daughter. It’s not going to change over night, but certainly your family members and others will notice a difference in you in trying to get better at it. Remember at the end of the day, sports are supposed to be fun, have good energy and teach us life lessons. You don’t want the lesson your daughter learns through sports to be that she can’t be around her father in the future. If she is busy focusing on the negative circumstances on your relationship with her, then she won’t be able to learn the real lessons sports can teach you; then she is really missing out on something special. Have a solid foundation of a relationship with your daughter in games and at practice – I promise, years from now it is more important than any strike she throws or hit she gets. (And if you are interested in the “right” now, YOU are effecting her confidence during a game every single pitch). The relationship you are building with her now is setting the foundation of your relationship with her 10-15 years down the road when she becomes an adult and faces the “real” world and actually needs you for something important. Want to be a dad to your daughter that she can call when she needs you most. Right NOW, when you are pitching or practicing with her, that level of “needs you most” is about her game of softball, but later it will be defined differently. If she feels she can’t count on you now, then why will she feel like she can count on you later? For me body language is the hardest to control. I don’t have a problem yelling, but my tone and body language I know have adverse effects on my daughter. It doesn’t matter if I’m coaching or not. She looks at me after everything to see my reaction. It’s something I try hard to work on. I guess knowing about it is an improvement, but I really need to get it more under control. Every parent of any athlete needs to read more and more articles like this one. Do you, or anyone out there, have any tips on how to control the body language? @Chad – Try forcing yourself to do something active – clapping, for example – in those moments when you’re feeling critical. It’s going to take an effort on your part, but she’s worth it, right? She’s making an effort, too, so appreciate and applaud her effort, even if it didn’t have the outcome you both would have hoped. She practices getting better at her game, put some practice into yours. Cheers and good luck! I mean no direct offense by this, but this should be an obvious red flag for any parent. If she’s constantly directing her focus to you, then she’s a.) not having any fun and b.) not playing with any measure of self-confidence. Remember to breathe. If she looks at you and you’re breathing, calm and reassuring, she will be breathe and stay calm. She looks to you because she’s conditioned to look to you for feedback good or bad, intentional or unintentional. Give her a small nod of approval, dont sit with your arms crossed hat on and head down shoulders slumped. Be proud of what she’s doing (whether she’s making a mistake or the game winning play) and stand that way. I’d also recommend helping her gain more self confidence so she doesn’t feel a need to look at you after everything. Love the last line of that: helping her gain more self confidence so she doesn’t feel a need to look at you after everything. That’s such an important part! Your body language is a reflection in your heart. Your daughter wants to know that you are for her. Be consistent with your response. Keep it simple. Be encouraging. These are all so great to use! For me it was a different but equally bad problem. I was the uber-coach. I never let up. She started when she was 8 1/2 playing 10u. I was giving her all the “guy” pep talks about having to prove herself worthy; about the other kid being more talented so she would have to work harder. I coached all the time….at home, on the field, in the car, on vacation. EVERYWHERE. 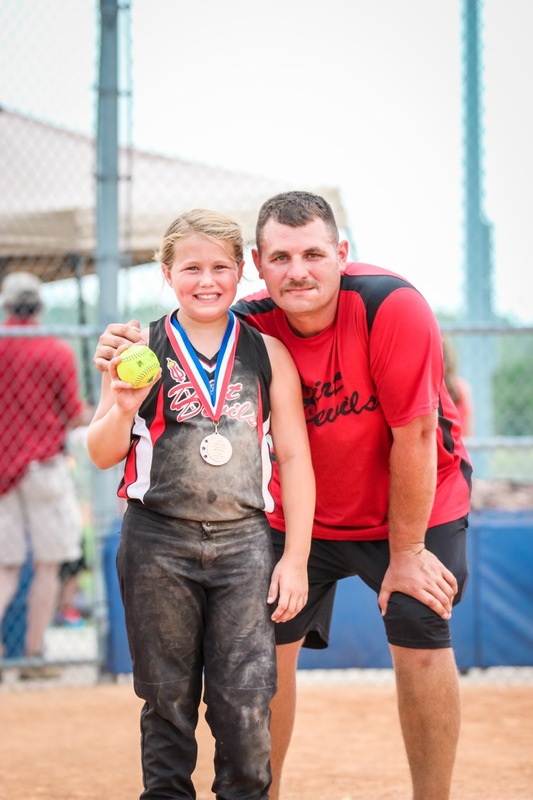 everything was about softball….she was a trooper and withstood it until 14 playing HS ball. She finally looked to her MOTHER to tell me softball wasn’t fun anymore. Pretty hard to look in the mirror these days. I hope my yesterdays have not ruined my tomorrows. This is my tendency, too (although not really “prove yourself worthy” content), and is something I need to be more aware of. My 10yo daughter talks often about wanting to be the best softball player she can be, but I need to remember that it’s a long road ahead, and not to spin the car off the road with my own enthusiasm for helping her reach her goals. Thanks for bring it up. Yep. That’s the hard part for me – remembering that not everyone works at my pace of rabid determination and obsession. LOL. We all move at different paces for sure! Jeffrey, thats me right now. She loves the sport and loves getting better; however, I am going to make a conscious effort to slow it down. It would break my heart knowing that I took the fun out of it. I still question if its the sport she is so in love with or the positive attention she receives from me when she plays. Obviously I am not the one to offer advice, but I will tell you that I think I would have done myself a huge favor by letting her determine the pace we were moving. In 6 years I can count on 1 hand the number of practices or events she missed…….the stuff she sacrificed on her own incredible…. The stuff I made her miss because we had practice or an event…innumerable. I am pretty sure that behind that amazing ability and talent she is still the little girl that wanted me to watch over her until she fell asleep……she said she wanted to be a great softball player. I heard ALL I want is to be a softball player…. Awareness is the very 1st step and it sound like you have it. Congratulations! Some never even get that far! Body language usually reflects an emotional response to something. So, the trick is to understand why you are having the emotional response, work to change how you look at things (perspective) so that you can have a different emotional response, and then your body language will naturally be better. Sometimes it starts with having your happiness, identity, and/or self worth tied to your daughter’s performance. If you can separate those, then while you will feel for her when she struggles or makes a mistake, you won’t be upset by it and you won’t have the negative body language that results from it. Easier to say than to do, but worth the effort! Good luck and all the best. Ray, what you said is so well written, thank you for taking the time to comment and writing it so informative and coming from a positive place! That means a lot coming from you Amanda! Thank you and you’re welcome. Nice job Amanda! I completely agree with your statements. Note: I have seen some moms just as bad. Without a doubt they are out there! I will need to have a talk with them later! Excellent piece Amanda. Great message to not just dads but coaches all over the country! Thanks Chez, thanks for all you do for our sport and the message you are putting out there as well! I think I started having a problem with this when my daughter first started playing. No so much being overly negative but a comment hear and there and that is just as bad I believe. Anyway, it didn’t take long to realize it wasn’t helping her at all. The smile on her face after every game now win or lose is amazing to me. She is one of those players that is one of the most experienced on her middle school team that is full of players that haven’t played much, and she supports her teammates no matter what happens. Why would I want to ruin that by making any kind of comment? It’s apparently very hard for other dads to stop this kind of behavior. I’m glad it wasn’t for me. Look at it this way. She knows what to do, right? Let her do it with her mind clear of thoughts of strangling you. Yes, that is what she’s thinking. Sorry. I have been amazed at all of the different dads who have come forth with some input and also putting out there that this is something they have struggled with. For each of you out there, thank you so much for sharing your own personal struggles with others, I assure you they are reading it and it is helping! Amanda, your article just hit me like a sledgehammer. My daughter and I had a blow up today at her hitting lesson and most of it was due to me being stressed about some other things that are completely unrelated to softball. I don’t think I am yelling at my daughter ALL the time, but when she does make a mistake I can admit that my body language speaks volumes and I could take a different approach. Throw that in with a 12 year old who is already upset with herself for making a mistake and it makes for a heck of a day at the practice fields or tournaments. I could go on and on, but I think you get what I am saying. I think this weekend I am gonna be doing a lot of clapping with my hands in the dugout, and when she wakes up we are gonna have a talk. 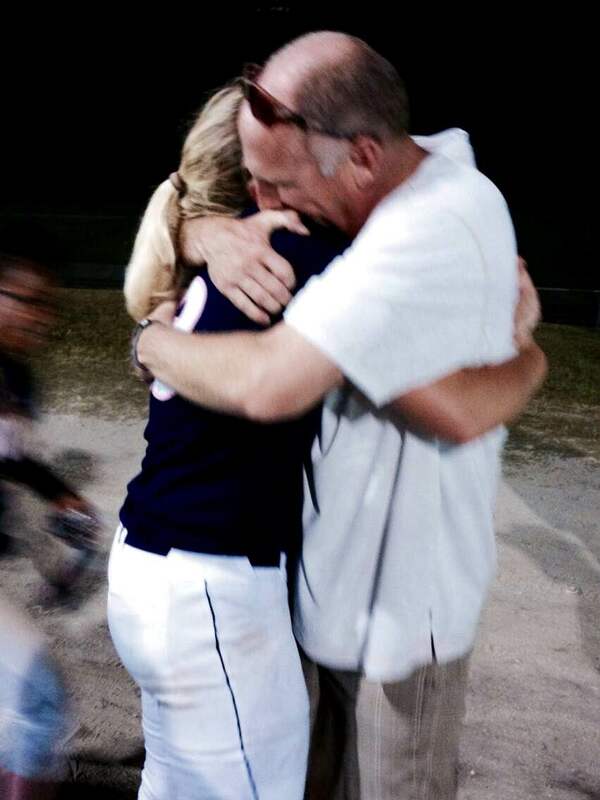 This Dad is gonna sincerely admit to his awesome daughter, on and off the ballfield, that he knows he hasn’t been handling his emotions the right way and we are starting fresh….. So happy my words spoke to you, thanks for commenting! That’s impressive to let her continue to work through it! Not easy, but definitely the right thing to do in some situations! Props to her for working through it and coming out stronger! Well done. Great article. I played baseball professionally and there is a distinct difference in coaching ladies softball. I Coach with other ladies and let them do a lot of the talking. I am a very big guy so I have been told I am intimidating and intense. Your article is spot on. I would also advise bringing in good female coaches to help too. I use the Chambers twins from Oregon. They have taught me a lot and so have you. Thank you. Thanks so much for commenting! Appreciate your insight from a different perspective! A world of differance it has made in the attitude and confidence of my 10 U daughter pitcher when I stopped being the “yeller” that I was and became the “encourager” that I am now. The excitement for the game that I had driven out of her through yelling is back again after I made a promise to myself and to her that changes in my approach to coaching her had to be made. I have found that by replacing yelling with simple signs and hand gestures mixed in with encouraging words while she is on the mound has indeed made her a more responsive and more enthusiastic pitcher and all around softball player. No one wants to be constantly criticized about their performance on the field and especially not in front of their team mates. I challenge all dads to take a step back and give your daughter the emotional breathing room that she needs and you will not be disappointed in the positive impact it makes on both you and your daughter. “I challenge all dads to take a step back and give your daughter the emotional breathing room that she needs and you will not be disappointed in the positive impact it makes on both you and your daughter.” – love this! Very wise words of wisdom. Hope all parents read this. Words & actions do affect you for the rest of your life . Make a difference in your child’s life. Be positive & count your blessings! Your children grow up so fast ! Make the best of each precious moment with them! Amanda has some great advice. Live the values you want your child to have. Dads are killing girls Fastpitch. We either need to get with the program, or get out of the way. Thank you so much for starting this long overdue discussion. I am the proud dad of a 16U pitcher, a coach and an umpire. I have seen egregious examples of the behavior you’re describing over and over from coaches and parents. Why do we make this game so hard for our girls? How many really play for themselves and love the game? When I have catchers apologizing to me for parents screaming at me from behind the backstop or experience a coach going full “Lou Pinella” because they don’t agree with a call I wish the dad in question could see what it’s doing to the players. I see the drop off in players as the girls get older and are able to make choices for themselves because they just don’t want to deal with it anymore. I want my daughter to have good memories of the hours we’ve spent together and the time that she spends with her team playing a game she loves. The best gift you can give your player is a smile, applause for her effort because she’s really leaving it all out on the field and show respect for our game. Look around, the best teams have quiet coaches, polite, supportive parents and fans and lots of smiling players. I feel ever since I stopped coaching my daughter not only has she really grown into the player I knew she could be we have a better relationship, I feel when I was coaching her she didn’t look at it like coach is getting on me cause I did something wrong she thought dads yelling again now I set in the bleachers and still yell but its all cheers!!!!! I coach my daughter team and it has been one of the more frustrating thing I have done thus far in my life. The reason its so fustrating is my daughters attitude towards me as her coach. She is only 9 and I understand that I am her dad and her coach and there needs to be a line drawn in the dirt the thing that is extremly hard to wrap my hands around is why after warm ups its the same ole routine from her. This routine includes her getting extremly annoyed with the very first drill that we do because she had something else in mind or the spot on the field we are i.e. third, ss, 2nd base. starting at isint where she wanted to start then she will go through the drill and not try. I have seriously considered quiting as well as making her quit becasue its embarassing to me as well as the rest of my family. We have somewhere around 4 to 5 hours of practice each week and I am not able to get through everything sometimes because of having to deal with this issue on an every practice basis. I found that coaching your daughter is the hardest part of being a head coach, my solution was that I coach the other 10-12 players and one of my assistant’s coach her. Steven I will have to try this approach. I have one of our 14U coaches coming to our next practice to work with the entire team and I plan to just sit back and watch. I’m an umpire working levels from 10U to 18U. I see the bad & good examples described. I think I should get pamphlets of this article printed. I try hard to not eject coaches, but rarely I’m forced to do so. I’d rather hand them the pamphlet and allow them to return after they’ve read it. A super job of showing a better way of acting on field. Also would carry some extra copies to hand through the fence for parents. This really hits home for me….I have been guilty of this negative behavior for years. I can only pray that knowing what I know now…there will be time to fix my behavior and plant plenty of positive reinforcement seeds. Great strory. I think when we were young and playing baseball, it was ok for coaches and dad’s to yell at us. This was the 70’s and 80 ‘s. So as we are now coaching our daughters. We feel to coach them the same way. I read a book about coaching girls and it taught me that boys and girls cannot be coached the same way. Yelling and screaming only hurts the girls and makes them feel bad. I am glad I learnt this when my daughter was younger. I feel our relationship is better from it. And she is a better softball player from it. A little off the topic, but I wanted to share…Right from the start, my daughter was gifted. Had good control from the beginning. In her first start in a game as a pitcher, @ 11 years old, she promptly loaded the bases with walks. Her coach called time out and walked to the rubber. After about 20 seconds she came back giggling. My kid then struck out the next 3 batters on 9 pitches. Her coach told me she was throwing balls on purpose because she didn’t want the batter to hit the ball. The coach told her to throw strikes, because the girls cant hit her any way. Long story short, I ALWAYS found the positive in her performance. I NEVER said anything to her during a game, or if I did it was something like “good job.” She never looked at me for reassurance. Even when she was young she was always in control. A standout in middle school and high school (over 1,000 K`s in her high school career, 3 time All State and played at a major college as a pitcher and outfielder. Attitude and focus were as important as skill. it separated her from the others. CUTE story and such a good lesson to be learned! Love it! Great article, and thank you for writing it. My little girl is 10 and in her third year. She is a pitcher, and has a lot of potential, but it has taken us three pitching coaches to finally find one who knows her stuff, and teaches in a way that is not only educational, but positive. I’m glad I found your site b/c I’ve never played softball, coached softball or really been around it enough to know all the ins and outs; but I love the game, I love teaching, and I love seeing kids excel. I look for resources like this to be able to help me be a better teacher, not only of the game, but the fundamentals, and this article, for me, is as fundamental as it gets. I’ve seen kids with potential wilt under the sound of an obnoxious father’s fury. And, I’ve seen kids with less potential flat out blow it away b/c of sound, and encouraging, constructive teaching/criticism. I think there is a difference btwn pushing hard and demoralizing and crushing the spirit of a kid. Thank you for your time and knowledge, Amanda. I used to be this guy and soon realized exactly what you are saying here Amanda,reading this actually brought tears to my eyes because it’s so true and I see dads like this daily and they are so lost on this topic and I hope they figure this out sooner rather than later,but after reading your post it’s even more clear to me how important it is to be that man/father that uplifts her rather than tear her down,thank you Amanda this was truly inspirational!!!! Sometimes it’s hard to look from the outside in to see what adjustments we can make and how we are being perceived. Sounds like you’ve already made the “adjustment.” Thanks for reading, happy to have you! Hey Amanda, your comments are dead on. Love them, encourage them, console them. Keep it positive and coach them like you would like to be coached. I really think this is a great article that we can all learn from. Life after softball is so much more important. See you out there. Amanda’s ( and Angela and Caitlin’s) Dad. Here’s a BIG shout out to all the Mom’s who sit on the bucket and cheer on their exceptional daughters. You deserve extra credit for your time and dedication for building strong, confident young women!!!!!!!!! Thank you Amanda this article could’ve come at a better time. I coach 18 team and couldn’t agree more. I also believe this can be applied to coaches and their players not just their daughter. Coaching 16-18 girls I’ve learned that they are very good at reading body language and demeanor. I truly believe that we as coaches have an effect on all of our players as role models and mentors and setting example with our behavior good or bad. Agree, it can be applied to coaches and players – 100%! I have read this article 4 times now, and it is a great article, but reading the comments and the “ahha” moments that all the dads are posting.. those are just as powerful as the article itself. It is easy to see those that are willing to accept their mistakes and correct the behaviors.. I have consciously tried to make sure this is a fun experience, and treasure the time, my son has already passed his High school sports career and I have so many missed opportunities with him. The only advise I can give is you can’t go backwards and make sure that you would be comfortable and happy if today was the last day you ever got to watch them play and you would have no regrets on the way you acted or presented yourself, your daughter or your family. Very good advice and things to point out, thanks for commenting! LOVE this article–would like to link back to it on our athletic league website–may we have permission to do so? We are an all-girls athletic league out of River Edge, NJ. This is our 50th anniversary year of providing youth sports to the girls of our town. Absolutely agree with your viewpoint here, and we’d love to be able to bring your words to our parents (Moms too!). We’d also like permission to print this article to hand out to our parents this season. thank you so much for these words–I think everyone who has a kid in any sport should read these and live by them! Yes you absolutely can link it!! Give it a go! Thanks for asking! oh, our website is http://www.regalsports.org if you’d like to check us out! Great article! I have a hard time over talking softball. To much talking mindset, or game situations while not playing or practicing. I should probably get away from that! It is hard, you want the best for them. Depending on the temperament of your child can cause different reactions. My daughter won’t break down, but I don’t want to discourage her when I am really trying to help her. OT, any suggestions for rest time for a girl who has thrown her arm out a few times? First time playing all year and the throws are piling up. Need to figure a way to be soreness free when games start. She is the kind of kid who won’t say anything until after. I know it is mechanics, which we are working on but I have a kid who has no middle ground. It’s all out or nothing. The long toss is what is doing if to her right now. It gets sore early in practice, by the end it feels better. Thank you Amanda! I, like a few others on here, have been that dad/coach that while I thought I was doing the best thing for her, was just the opposite (according to your letter). Your very well written letter above has hit home with me in a very profound way. My daughter Avery has been playing now for a few years and is finishing up her 8U Rec and Select All-Star season over the next few weeks. I am going to do my best to remember your words, be supportive of her through all the ups and downs of her playing, and listen to her more rather than criticize, correct, or preach. I owe that to her. her do her best. We both put in so many hours of pitching. Then on the way home I look in the rear view mirror and see this chocolaty faced kid, and realize she is 9. She loves softball and loves me. She forgives me of my reactions and I owe her better. more important than a yellow ball and 4 bases. I have found in my experience, my “yelling” or signs of disapproval (which have destroyed my daughter at times and ruined any coaching I could have done at the time) came from 1. Knowing she could do it because I have seen her do it (putting blame on her for losing focus – because I forget she is young still and realizing it is just a game) and 2. My own inability to express what I am seeing wrong in the mechanics. I think my own frustrations come from my lack of ability to help her. Vague example – You are swinging wrong, I can’t explain exactly how to fix it so frustrations arise. And instead of encouraging poor mechanics changing my tone of voice or body language destroys her and my ability to make the corrective changes. How much of our frustrations come from our own inabilities as coaches? As I have watched many amazing coached work with my girls, I have picked up the language of how to fix a swing, or a throw or any other aspect. So now I have the vocabulary and know what I am looking for and my frustrations have gone away because I can now help and not feel helpless. Our daughters, players, kids etc.. are so wonderful, we should be nothing but encouraging and uplifting.. Great article. Great article and more dads should read it! My dad was outrageous when I played as a kid and it was awful. It totally ruined our relationship and now at 28…he’s out of my life because I couldn’t take it anymore. Dads…take it seriously! It’s just a game. Be nice to your daughters or you may never get her back! Thank you for writing this! A few months back I caught myself being everything I shouldn’t be. Maybe it’s due to the level of baseball I played in my day, maybe it’s because I expected her to be to an unrealistic end result at the time I felt she should be at. I realized that none of my internal justifications mattered! My awakening came during a scrimmage. My daughter was pitching and by chance she hit a batter and I got up and got water. The inning didn’t end well for her. And, I didn’t mind it at all. BUT, after the game mu daughter told me that she saw me get up and walk away. She asked me if I had walked away because I was disappointed.. THAT KILLED ME INSIDE! I truly got up to get water, I showed her the bottle, but, I took that time to make a solemn promise to her! I promised that she would NEVER see anything but support in anything she shoots for and may come up short on! It’s funny how as kids we’re taught not to yell or cry to get what we want, but then so many of us end up resorting to yelling as parents. Yelling at your children is never a good or reasonable method for disciplining them or getting them to do what you want them to do. It’s like me in this situation right now. She loves the sport and loves getting better; however, I am going to make a conscious effort to slow it down. It would break my heart knowing that I took the fun out of it. I still question if its the sport she is so in love with or the positive attention she receives from me when she plays. I find it very hard not to be over anxious when my daughter is pitching. Working on it. Just want her to accel at the the game she has loved since she played for the first time. I so enjoy the bond we have as we travel to different parks I try to start the ride home with did you have fun today ? WOW!! Just got home from a Basketball game yesterday where my daughter did not play her best. She pitches and plays first base. I have 3 daughters 5,10 and my oldest is 12 who also is tall for her age at 5’9″. She tells me she loves softball and only started pitching last year in 5th grade. She is already up to 50mph. I can relate to all the comments from the other dads – my body language my comments, talking too much and not saying enough positive things. I also have a struggle with the fact that my oldest is also receiving more criticism from me due to her lack of interest in practicing by herself – or being motivated. I know when i was young i threw a ball and shot hoops in the rain until my parents told me to get inside. I am not trying to get a scholarship for my daughter but i do struggle with her not maximizing the physical talents that she clearly has. Can you give me some advice on how to calm down or encourage this in her. I think sometimes EVERY girl out there will need a little bit of pushing! Push her sometimes, give her tools to help her figure out that she needs to put in the effort on her own and she will reap the benefits. It’s definitely a continual process and more than just what you say to her one day! It’s a cumulation of days! Amanda is spot on, as always! 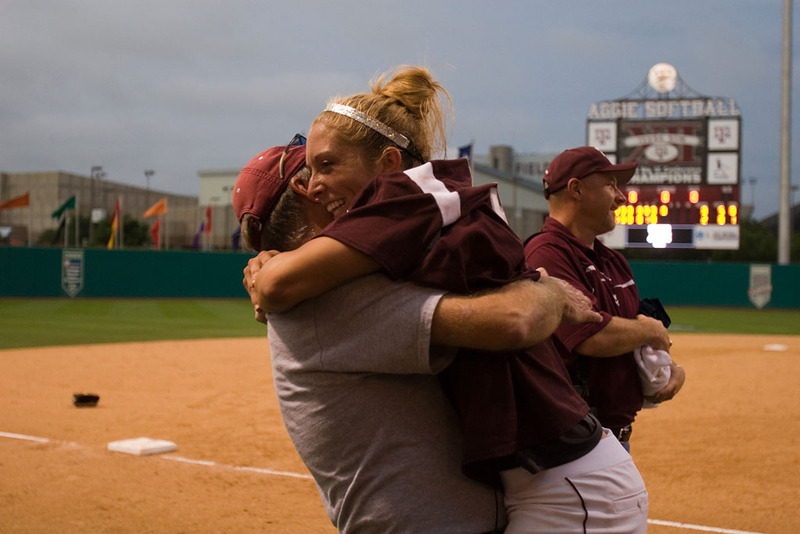 Many of the top softball players in the country can recite stories of their mom or dad pushing them, at times, to practice when they did not feel like it and then, down the road, being thankful that they did that. It is a delicate and constantly adjusting balance to know how much to push, when to push, and when not to. Sometimes the big “Ah Ha!” though is realizing and accepting that your daughter (or son) is not you and may be wired differently than you. Like you, I have been driven for achievement my whole life (I played sports in the rain, mud, snow, whatever) – I was just wired that way and it was like breathing to me. I didn’t need it to be “fun” or need the accolades or encouragement (they were nice, but they were not the “why” I did it) – I was driven to master something, competing against myself and my goal was fun enough, and achieving a goal and the self satisfaction from that was sufficient. Being that way, I didn’t always “get” why others weren’t the same way, especially those that I thought had a lot of potential that they could turn into something great. And, at times, that could be frustrating to me. When I came to see my kids, and the players that I coach, as unique individuals, I was able to be a better parent and coach, giving them what they needed to be successful, and not necessarily what I needed, what made sense for me, or what worked for me. Awareness is the 1st step to improvement! Congratulations on taking that 1st step and good luck and all the best on your journey! Hey Amanda. I am a father and a coach. While I don’t deny the validity of your claim here I do think to isolate dad’s is unfair. Mothers can be some of the worst helicopter parents/coaches I’ve ever seen. I have more mom’s standing directly behind the backstop and coaching from the bleachers than anything. I coach 9/10 girls. Since your article was so long I feel the need to rebut with an example. I had noticed this girl throwing underhand in the outfield one practice while they were supposed to be doing their long toss warm up. Smoothest, natural arm circle I’ve ever seen. She pitched an inning in our next game and was great. With no work or coaching from me whatsoever. Next game she pitched in, I had no idea who was in the circle. Just flat out bad. Horrible. So needless to say I was flabbergasted and it was strange at the time, a cry for help in hindsight, but she kept looking to me in the dugout like please come get me. After a few walks and hit batters, I went and got her. Come to find out, mom worked her for an hour and a half every night for like a week straight. Mom destroyed her. Prior to this, this young lady had horrible confidence. She was scared to step into the batters box half the time. After I pitched her the one night, she was a totally different girl. Walking with a spring in her step. Fast forward a week later, she had no idea whether she was coming or going. Again, mom destroyed her. Completely. No one parent is perfect I just feel it’s unfair to single out one side or the other when usually from what I’ve seen, one bad parent if really any different from the next. Love you and your articles and everything. Just my opinion. Everyone’s experiences and what they’ve seen are always different! Appreciate your input, and I think you’re right. I singled out dad’s because a father/daughter relationship seems to have different implications than a mother/daughter relationship. I think to the future of how a male figure father is setting up the future for the daughter of how it is/is not ok for how a man can talk to her / control her. That is why a dad article is so important to me, a dad is the first man a daughter will love. Agreed Paul. This point is just from a daughter’s perspective – and at one time and maybe still today in some cases – it’s important to highlight this about how a daughters view their father or any male figure. It speaks to the opportunity to have a more meaningful relationship between daughter and father to someone who may not have had this vantage point before. No one is 1 -siding this…Mom’s can be destructive in their own ways ( myself included). We’re not perfect – we just want the best for our kids but it’s important to highlight that we should be respectful of each other mom-daughter or father-daughter vice versa. I love that Amanda leads with we are a team with a common goal and the most important attribute you can have is confidence in yourself and your team reaching your goal. My daughter is 15 and plays on an 18U team. Not that unusual but she can play. I’ve been her “coach” since 10U. The last few years as she’s started to shine we’ve had issues where she loads too early against live pitching and thus has to slow her swing down to make contact. She’s still hitting over .400 but not near the power as in the cage. So I’ve been on her a bit about practicing 15 min. every night in the net and doing the drills her coach tells her to do nightly. (20 min. tops?) But unless I “nag her” about it she doesn’t do them. So she’s developed these “bat tips and dips” in her load that uses up time waiting for the ball to get to her because she loads too early. We’ve made progress. A lighter bat seemed to help. But I’ve been getting frustrated that this great cage hitter doesn’t/can’t bring it to the field and isn’t doing her off field drills to engrave that cage swing. She just asked me to not go to her batting practice with her team, first time ever. I think she doesn’t want me to get on her about her mechanics. I don’t want her grooving a bad swing while I’m not there. I also don’t want her to hate me! If you have a player that has great potential but just won’t do anything on her own….won’t ask for a lesson, won’t practice, won’t watch a video or do a drill in the mirror, where do you draw the line an make them choose between travel ball or just rec. or nothing. I think it’s a waste of my time if she just phones it in. Great article, a lot of dad’s would be well served for reading it. The game is not suppose to be about the parent but the athlete. Parents support your child and their teammates. This is such an excellent standard to aim – for all Dads and Daughters! It’s important to remember that the goal is still the same to bring up a child who is respectable and knows their self worth in everything that they do. Thank you Amanda for reminding Dads that they are the first man in their daughter’s lives and she should hold every man to a certain standard for the way he speaks and treats her. Also, thank you for reminding us that we play for fun but with a goal in mind and a good attitude towards others. Hi. I have been coaching my daughter for about 5 years. I never planned on this. I personally played baseball my whole life, but I figured she would be a ballerina. Until that one day when she said “daddy I want to sign up for baseball”. It started off innocent and slow. Teaching how to throw and catch. It was fun. Once she started to play year round Baseball and see a lot of success, it turned me into a monster. I have gotten greedy for her success. I’m no fun anymore and it’s baseball 24/7. This is not what I wanted. It just seems like a never ending cycle of trying to keep her up with the boys. I yell, I punish, bad body language, mean words, etc. Pretty much worse than any of the other comments I read on here. We have always been best friends but it’s being threatened now. Help!! !